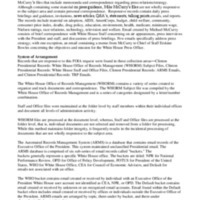 This collection consists White House Press Secretary Mike McCurry’s files, including memoranda and correspondence regarding press relations/strategy. McCurry served as the White House Press Secretary from 1995 till October of 1998. The collection contains daily press guidance and briefings, invitations, statements, talking points, reports, and emails. The records include material on adoption, AIDS, budget, child welfare, drug policy, education, minimum wage, press interviews, technology and welfare.